Does your car have a dent? Are you looking for a dent repair specialist? Dynamic Dent Repairs can help! Tell us where you are, about your car and what areas are damaged. We will repair it at a great price and your car will look like new! We offer discounts to motor trade customers! Dynamic Dent Repairs are pleased to offer discounts to motor trade customers. Contact us for a quote NOW! What is Paintless Dent Repair (PDR) and why should you choose it? We answer these questions and explain why Dynamic Dent Repairs is the right choice for you and how we can save you time and money. Welcome to Dynamic Dent Repairs. We are the number one low cost car dent removal company in Essex, Cambridgeshire and Northamptonshire. With over 10 years' experience in removing dents from all car makes and models, you know that you're in good hands! 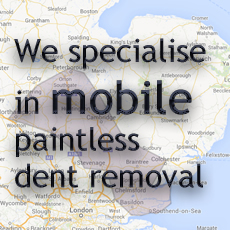 We specialise in mobile paintless dent repair. Paintless dent repair basically means that we remove or repair dents, knocks and creases from your car using specialist tools without the need for any paint work. If you can't find what you are looking for take a look at our FAQs, try our search or contact us. 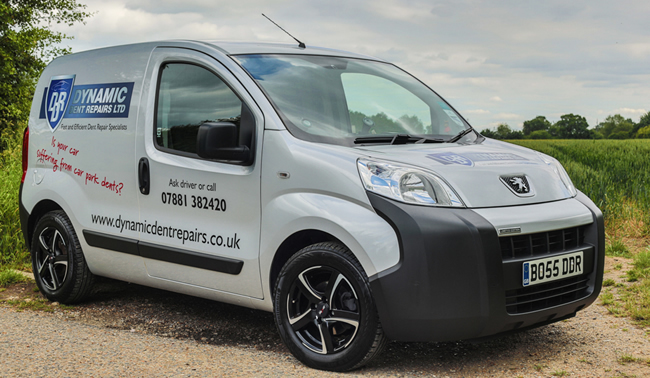 Alternatively, if you would like to discuss your dent repair needs in more detail, please call us on 07881 382420. Grant you're a star no sign of the three dents in my door. Communication was brilliant, can't recommend you enough! Spot on service and repair, quite facinating how the dent is slowly manipulated out and shaped flat again. Grant was absolutely brilliant he managed to get the dents out the rear panel of my wife’s Ford Focus convertible. Great job done to remove dent in rear wing of my car, would highly recommend. Brilliant service and result from Grant. Perfect finish and so quick. Grant was very prompt in replying to my enquiry. He did a great job quickly and efficiently. Would definitely recommend. Great job, no sign of any dent, would definitely recommend. Grant's dent repairs are fantastic! Reliable and honest guy, recommendation all the way! What a nice man Grant is. He came out on Sunday morning and repaired a dent in the roof of my Jag. This only took him about 45 mins. This guy really knows his craft. Soft hands for a big man ! Called Grant Saturday, he answered immediately and he came the next day. INCREDIBLE. Did an absolutely amazing job on our BMW, couldn't even tell there was a dent. Speedy and very reasonable. Dynamic Dent Repairs came out to me the next day with a service that was second to none. Grants work is what you would expect from a professional who has mastered the art of paintless dent removal. Excellent service, would use again and recommend to anyone. Thank you ever so much for sorting my Grey Audi TT dent out today, really appreciate it and you done a fantastic job.